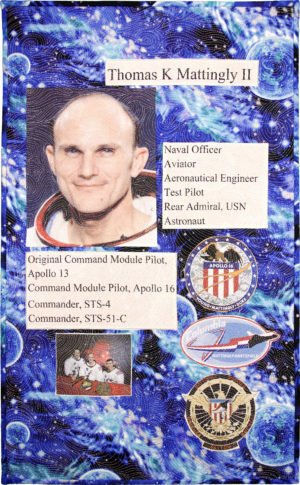 Of all the Apollo astronauts, Ken Mattingly is one of the most accomplished. A Naval aviator, test pilot and aeronautical engineer, Ken was the original command module pilot for Apollo 13 but was sidelined because of his exposure to measles (which he never contracted). He was later command module pilot for Apollo 16 and Commander for two space shuttle missions. After retiring from NASA in 1985, Mattingly went to work in the private sector for the largest Government contractors in the country, Northrop Grumman, General Dynamics, and Lockheed Martin. At 79, he is retired from government contracting, but he is still out and about on the lecture circuit. Fabric printing, fused, machine quilted.